12 Days of Giving Gift Card Sale | BRAVO! It’s here! 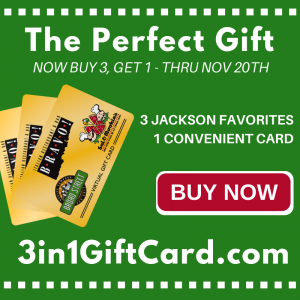 Our only discount sale of the year where you can save big on our 3-in-1 gift cards. Perfect as presents, stocking stuffers, or greeting card inserts our gift cards are the ultimate gift for your foodie friends or anyone who you want to treat to a nice meal out at one of Jackson’s three favorite restaurants: BRAVO!, Broad Street, and Sal & Mookie’s. Sale ends at midnight on Tuesday, November 20th! So SAVE NOW by ordering online here or visiting any of our restaurants during store hours. « The BRAVO Way: eBooks Now Available for Pre-Order!